I have to start this post with a disclaimer. See, I've written about a lot of controversial things. I've openly advocated for cover-free public breastfeeding. I've talked about racism, sexism, and ableism. I've talked a lot about politics. I've even hated on a lot of Disney movies. Sometimes people get mad. But the thing that makes people the maddest seems to be when I talk about food. I think I get it. We've heard "you are what you eat," and that's supposed to be meant as an axiom that encourages us to eat healthy food so that we can be healthy, but it also has social implications as well. "You are what you eat" in the sense that how and what you eat defines a lot of your interactions with the day to day world. It defines what stores you're going to frequent the most often, what restaurants you go to, and it will come up again and again in any social setting. And the same people who are quick to assume that fat people eat "unhealthily" also assume that thin people (and especially people who have lost or are losing a lot of weight) have adopted a healthier lifestyle, by sheer virtue of their shrinking frames. WELL NOT ME! I'd eat 100-calorie packs of carcinogens and razor blades if they were low in calories and tasted vaguely like Oreos. And isn't it interesting how much less people care about unhealthy eating habits when someone is getting smaller instead of larger? Then there are the whole ethical ramifications of food. Yes, that includes the ethics of the food itself, whether it was raised humanely or treated with chemicals or produced locally. It also includes the ethics of who prepares food and how that work is distributed, a complicated socioeconomic issue that includes everything from treatment of workers producing that food in other countries to the division of labor in the home. Food can be a touchy subject. So I start this post with a few key statements: I am not trying to say what the "right" way to eat is. Chances are, you eat differently than me. I don't think I'm doing it better than you are. I'm not trying to convert you to any method of eating. I'm not even trying to convert me into any method of eating other than "better." Here's why. A few years ago, my diet was not healthy. I frequently ate fast food and stuff that came from boxes and bags. I didn't eat many vegetables, and I didn't question where my food came from or how it was produced. This is how I grew up eating. I wasn't sick all that often, but I didn't feel good all that often either. I had huge energy lags, lots of headaches, and an upset stomach at least a few times a week. I wasn't taking care of my body. The changes happened incrementally. Those changes started partly because I became pregnant and became more conscious of the fact that what I was eating was used to fuel the development of another person. Some of those changes came because my family has some real health concerns that scare me. My dad has his first heart attack in his 30's. He died of complications from arterial disease in his late 50's. My family history involves diabetes, cancer, and heart disease. I want to take care of myself. We cut out soda, and I had been drinking two-three cans of Diet Pepsi a day. Then we cut out some processed ingredients like high fructose corn syrup. Then we started focusing on getting better quality meat, locally-raised without any additives. I've been feeling healthier, stronger, and more energetic with each successive change. So now I'm giving up sugar. I'm also giving up dairy and grains for a month. I'm doing the Whole30 challenge, which basically means no processed foods, no grains (including corn), no dairy, and no added sweeteners (including honey) for a month. A lot of people hear that I'm doing this and assume that it's part of a weight loss plan, but it isn't. I actually don't care at all if I lose any weight during these 30 days. I am much less concerned about the size of my body or the number on the scale than I am the quality of my health and the food that I put in it. The Whole30 program talks a lot about changing the way that you think about food, and that's part of the reason that I'm doing it. I definitely notice my tastes changing, and I definitely notice my concepts of how to put together a meal getting much more creative. Plus, when you can't eat grains or dairy, you eat a lot of vegetables. Here's the thing with the sugar, though. I like desserts. I have absolutely no desire to get to a point in life where I don't eat dessert. I'm not against sugar. I think it is delicious. But I also think that my personal use of sugar is not healthy. There's debate over whether sugar addiction is real addiction (like that to drugs or alcohol), but scientists agree that sugar has an impact on the brain's pleasure center and--as this article does a good job of explaining--that can certainly cause us to interact with it differently than other food. Also, sugar is in everything. It is almost unbelievable how many things food manufacturers put sugar in and the lengths to which they will go to hide it in the ingredients. I will definitely eat a cupcake again (probably on February 1, the day my 30 days is up), but I want to get to a point where sugar is not something I need because, in actuality, it is not something I need. I should never feel like I can't turn down a cookie, not because there's anything wrong with eating a cookie when I want it but because I think there is something wrong with not being able to distinguish actually wanting it from just blindly accepting anything sweet that's placed in front of me. I want to be a conscious eater who makes choices based on a variety of factors, health, pleasure, and ethics all taken into consideration. i could write pages and pages on this subject, so instead i'll just say: you are going to notice a HUGE difference! and when you get to Feb 1st and you're not craving sugar (which you won't be as long as you're not drinking alchohol either), i strongly encourage you to go longer. you will feel better and better the longer you go without it. fruit will be your new sweet, and when you try processed sugar again, it will taste harsh and processed. i am amazed by how great i feel when there's no sugar in my diet. good luck with it--i hope you end up feeling as great as i did! Thanks, Deb! I definitely already notice a more stable energy level and changes in my tastes. I thought it was going to be really hard, but after the first few days, it's been pretty easy as long as I plan well enough to have food on hand. I'm glad to hear that it worked so well for you! I'm on my 16th day of no sugar. 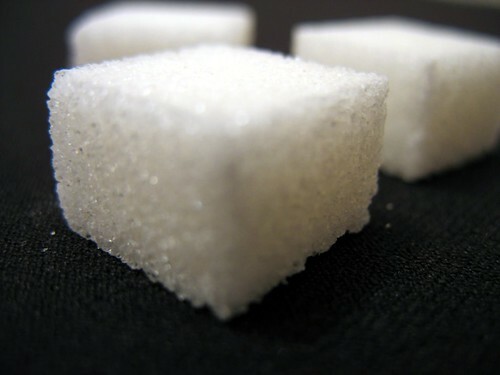 I've cut out soda and other sweets as well as processed foods that contain any form of sugar. It's been an interesting experiment. The first few days I felt like crap (probably due to the double whammy of also going through caffeine withdrawal since I gave up Pepsi). After that I felt much better. When I did slip up and had a half cup of pasta sauce that has added sugar, it actually tasted way too sweet to me. I'll have to find another one with no or less sugar to try. The oranges I've been eating taste extra good to me. Most interesting to me has been the impact on my appetite. I'm not craving snacks between meals. I'm far less hungry and am eating less food overall than I normally do.